The Hawks have paid tribute to their ‘special’ Pompey relationship after booking another pre-season meet-up. Paul Cook’s side will visit Westleigh Park on Wednesday, July 13 (7pm). In recent times the fixture has regularly served as the Blues’ pre-season opener. 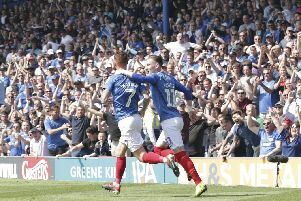 However, this summer it will take place after Pompey’s week-long Ireland tour. Regardless, it represents the 11th successive pre-season the match has been scheduled. And Hawks director Trevor Brock is delighted to maintain the friendship with their local Football League club. He said: ‘It is great to keep that special relationship with Pompey going and we are very grateful for their continued support. ‘With them being in Ireland the week earlier, they gave us the first friendly in this country upon their return and we are happy with that. ‘The friendship between the clubs has never been stronger and financially for us it is massively beneficial. ‘Pompey haven’t forgotten how we offered to help them in dark times. We were literally prepared to hand the ground over to them and massive plans were in place. ‘Thankfully, that was never needed, but it is lovely we are still considered friends and theirs is the first result we look for. The Hawks suffered problems with their pitch during the second half of the season. Waterlogging also prompted the scrapping of the pre-season encounter between the sides in 2012. But Brock insists summer work on the Westleigh Park surface will pay dividends in the campaign ahead. He added: ‘Our pitch will look a peach, I guarantee it. It will be in fantastic nick. ‘There are a few underlying problems there and we have had another go at it, although for the first four months we usually have the best playing surface in the league. ‘The problem is down to where we are situated, it is nothing to do with putting things into the pitch. ‘Where the ground is located we are on a high water level and until we eventually move that will always be the situation. n See page 55 for Hawks v Baffins Milton Rovers report.